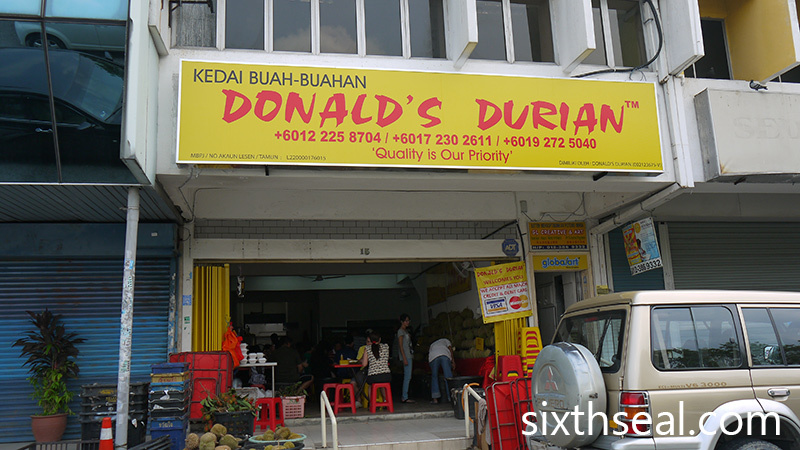 I was searching for Tai Yuen durians over the weekend and drove to Donald’s Durian new Section 19 place (which is just around the corner from their old SS2 stall). I haven’t been here in a while coz their old place was so huge that all the interaction was with their hired workers, some of whom couldn’t explain the different durians properly and just wanted to get the sale done. That was in the past though – there’s no such problem now, their latest location is smaller and the owners and key people are all there at your disposal. I met Cindy (who somehow recognized me from my blog) and she told me all I wanted to know about their durians. Unfortunately, the Tai Yuen durians were all sold out. I was told that the Johor durians season is ebbing right now (though it might start again) so all the durians are from Pahang. 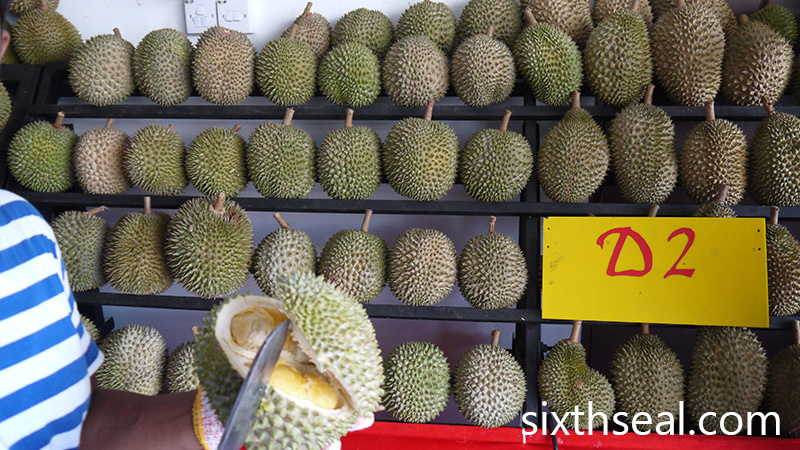 The service is extremely friendly and knowledgeable – two things I look for in a durian stall. 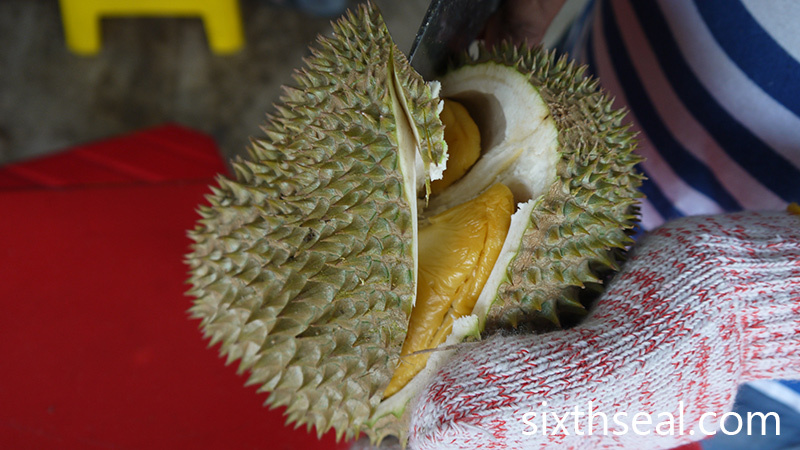 It also helps that their goods are very fresh due to the high turnover and all the durians just fell and came from the orchards on the very same day. 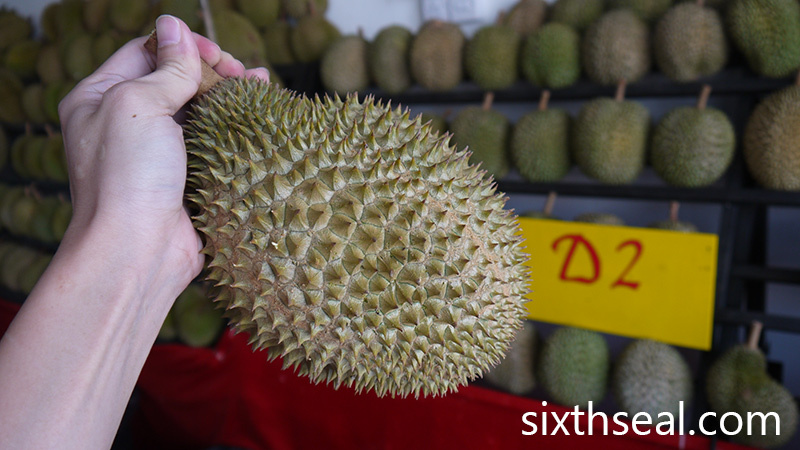 This D18 Durian is a slightly bitter durian with large seeds and very little flesh. I haven’t eaten it in a very long time and I wanted my better half to try it too. The durian is almost perfectly round with a very thick skin. There were only 4 locules in my Durian D-18 with 2 pods each (one had 3). 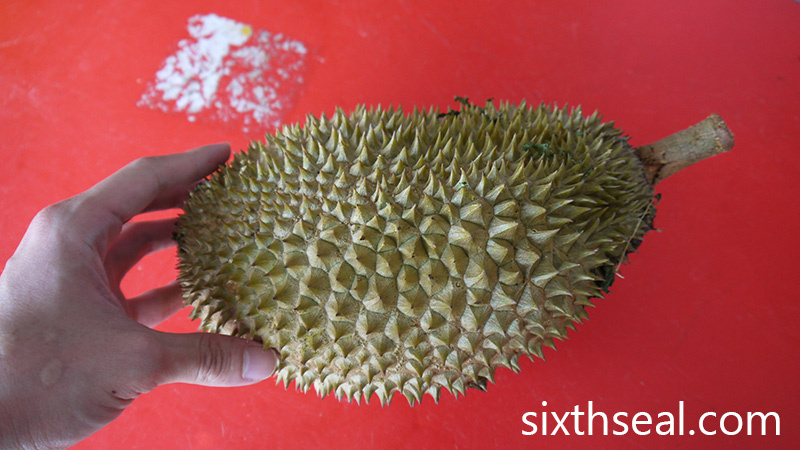 That comes up to just 9 seeds and flesh from one 1.4 kg durian. 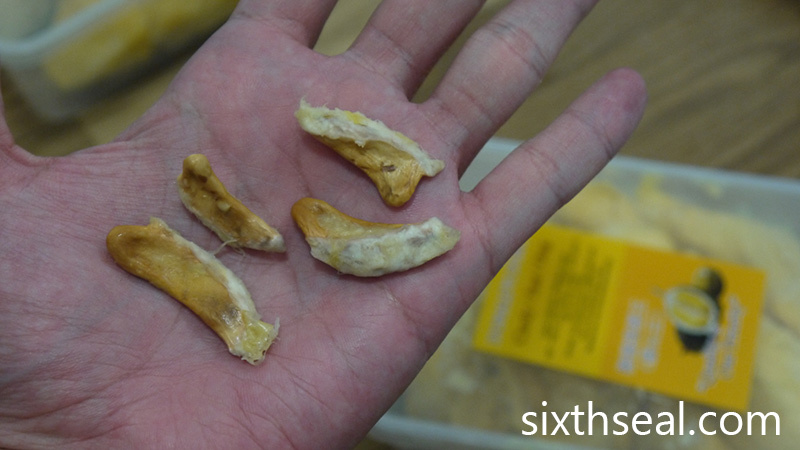 Furthermore, the flesh surrounding the seeds is extremely thin. This isn’t a meaty durian, you eat it for the taste. 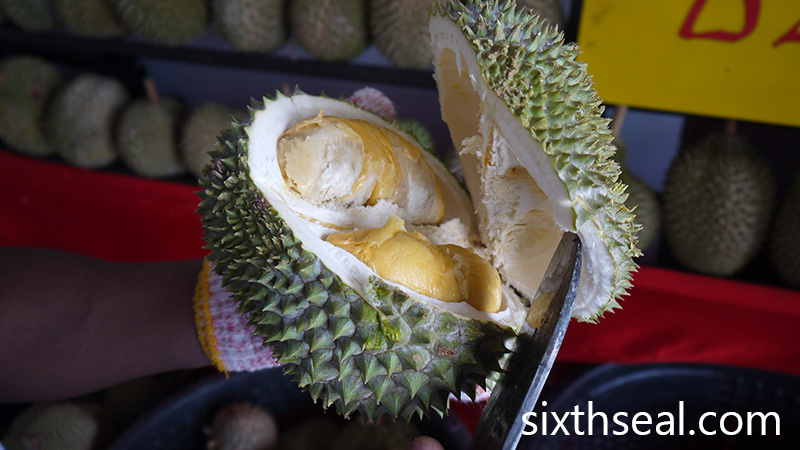 The large seed combined with the meagre flesh doesn’t make this a very popular durian clone but I was after the less popular ones this weekend, to introduce to my dear the sheer variety that durians exhibit and the extreme difference between the various clones and cultivars. 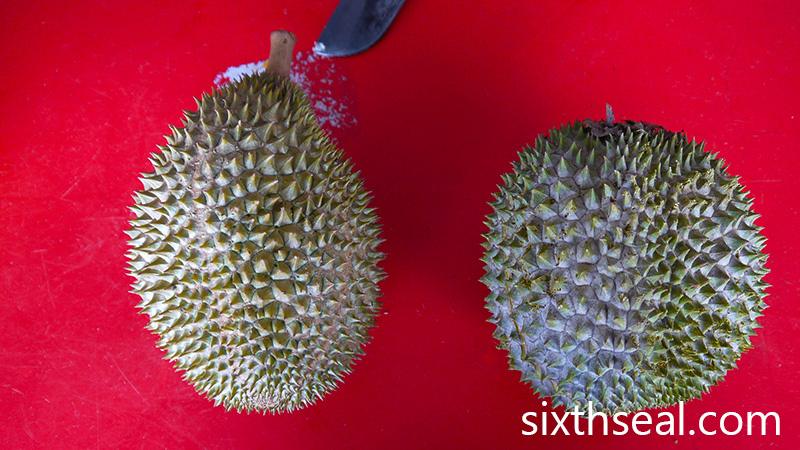 The D18 Durian is good for what it is – a simple durian from the older days with very little (albeit tasty) bitter and fibreless flesh and large seeds. I’ll call the flesh on the seeds more like a coating than flesh per se. Haha. I love the characteristic wrinkly skin of the D18 though. It’s a bit of a curiosity and I highly recommend it if you haven’t tried it before. It won’t be the cheapest durian out there since the total amount of flesh you can get from one would barely make you satiated, much less full. 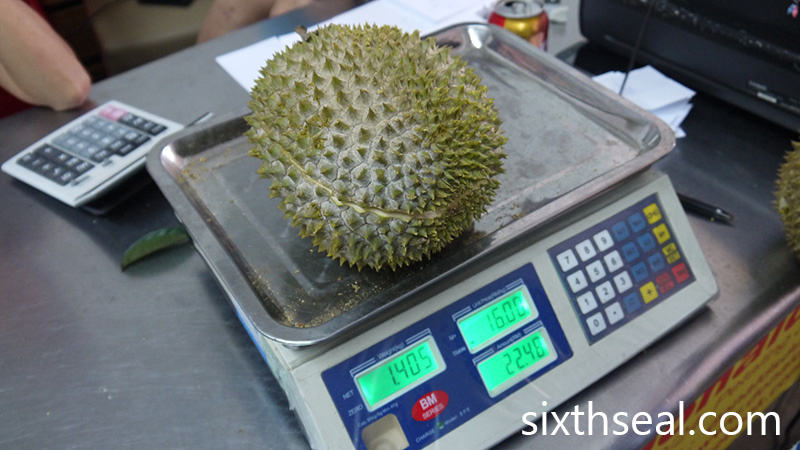 The D18 Durian’s weight mostly comes from the large seeds and thick skin. It’s is listed at RM 17/kg so this fruit cost RM 24, but if you’re a true durian fan, you’ll want to get your hands on one just to see what it’s like. Cindy recommended their D2 Durian. This is commonly known as Dato’ Nina and she told me they just came from the orchard in Pahang today. I opened one to try and it blew me away. I was amazed! I instantly felt ecstatic when I tasted the D2 Durian – it’s like a drug! The combination of fat and sugar (which supposedly doesn’t exist in nature) elevated my mood so much I thought I had accidentally ingested a controlled substance. The Dato Nina was rich, creamy bittersweet goodness and the fiber makes you chew and extract more flavor out of the flesh with every mouthful. It was so good that I immediately got another D2 Durian coz I knew 1 would not be enough. 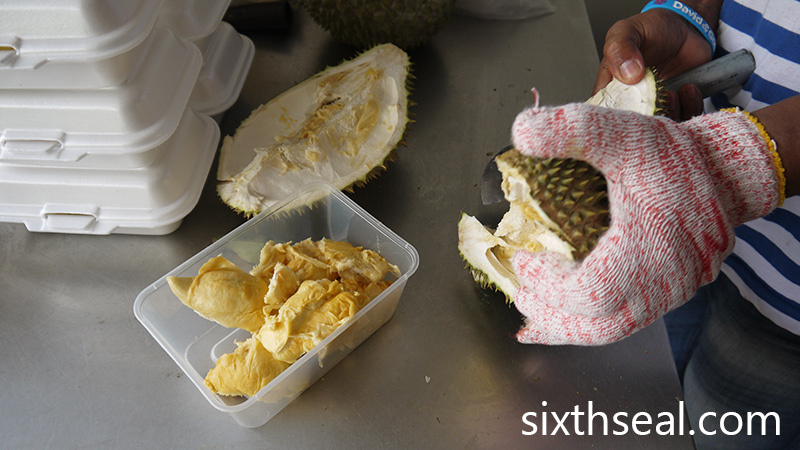 That’s the difference between fresh, top quality durians – it makes you want more. 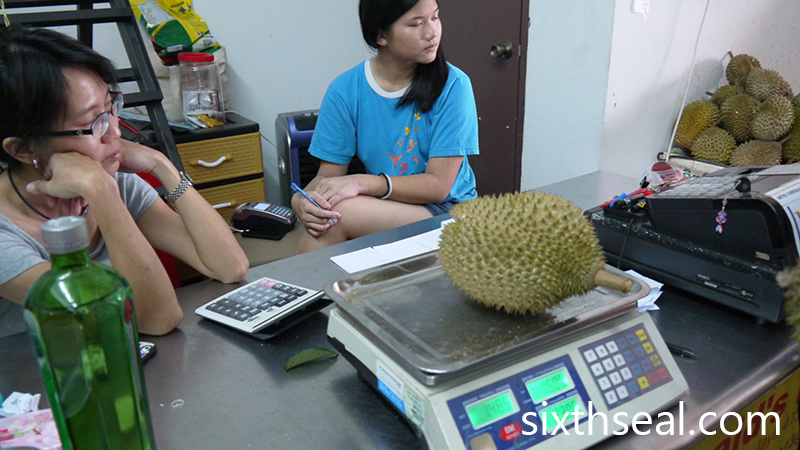 It was going for RM 16/kg and the first durian weighed 1.5 kg (RM 24) while the second came in at 1.7 kg (RM 27). I’ve eaten so much fibreless durians this season (Musang King etc) that I’ve almost forgotten what a good fibrous durian can taste like. It can be even more flavorful since the fiber forces you to munch more and each time your molars masticate the durian flesh, the strong notes of D2 comes through with every bite. I can see why the more fibrous durians like D160 (Teka / Green Bamboo) has their own cult following. Dato Nina was one of the earliest registered clones (1934) and she’s not showing any signs of her age. It’s shaped like a kidney, very odd and distinctive so it’s quite easy to recognize. The D2 durian is also very, very hard to open unless you’re an expert. Even the staff had some problems and expended a lot of effort opening the two D2 durians I chose, but easily cracked open the D18. The D2 durian looks like a messy slop of pulp but nothing could be further from the truth. The seeds from this Dato Nina is shrunken and vestigial, which is why the durian flesh doesn’t “hold its shape” and flops around. You get a whole lot of flesh around a tiny and flat little finger sized seed. There’s also a larger shark teeth shaped seed, which can be found around 1/4 of the time, while the rest are tiny seeds or no seeds. It’s quite unusual. While I’ll normally wolf down durians, the D2 Durian forces you to ponder over it, to take your time and appreciate all the subtle and not-so-subtle nuances and savour every delicious mouthful. Just as I thought no more taste can be extracted anymore, another chew to attempt to get through the fibrous flesh proved me wrong and engulfed my palate with a deluge of more wonderful flavors and aromas from the Dato Nina. I’m converted – a good Dato Nina freshly fallen from the orchard can be better than most of the more famous branded durians. My better half didn’t like the fibrous nature so much though so YMMV. Personally, I’ll go back to Donald’s Durian again just to eat their wonderfully sourced D2 durians coz we finished the last of it a few hours ago. That place must be extra “fragrant”, I’m sure. Like when I used to stay at Pearl, Old Klang Road – the lobby was always filled with the durian smell as they sold the fruit from Thailand at the supermarket in the adjoining complex, so much so that it sort of became their “trade mark” – the durian hotel. LOL!!! I was actually planning a quick drive down to Penang to get some late season Penang durians (hard to get outside of Penang since the demand is so high) from an orchard to bring back to KL to eat before the season is over. Nice! OKR has changed a lot, nowadays it’s trying to be an F&B destination. 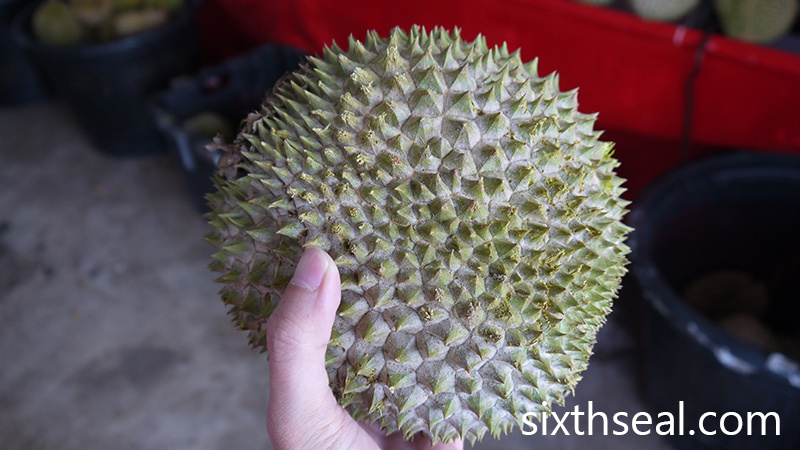 If you’re getting it from JB and from a reputable seller, it should be the real deal and you can look for characteristics from the durian itself too. However a Johor Red Prawn (which we get here in KL too) is very different from a Penang Red Prawn (which is hard to get outside of Penang). I think the latter is much better. Yum…i love those with bitter taste. Have mostly tasted d24and 101. It’s very accessible and D101 is as well (generally sweet, very friendly durian). However, most stalls do carry other cultivars/clones too e.g. D88, D13, D1 durians but you probably have to ask them since they usually only advertise D24, D101 and Musang King. 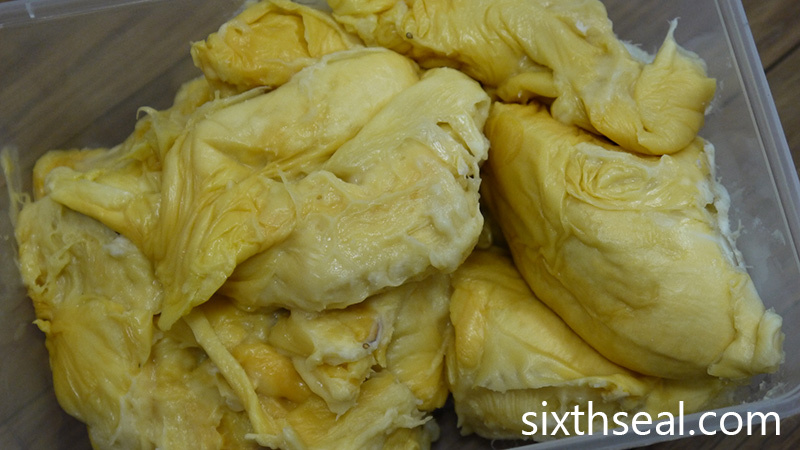 I used to like durians when i was a kid, could even eat up a storm until jatuh sakit. But as I grew older, I found I like them less and less especially since getting rid of the smell was soooo challenging, making it hard to pull a straight face in public hahaha. I now just am crazy about tempoyak, the fermented durians. But looking at them yellow flesh reminds me of the good ol days. Enjoy! Wow! So many grades and names. I used to like durian as a kid as dad and mum loves durian. But grow out of it as I grew up. It has been years since I tasted one. I think the last time was in Kapit many years ago. These are all from one species too, we have other species as well (just a little harder to find and not as commercially viable). I miss the durian hutan from Sarawak too, the small red durians we get from the jungle. That’s a unique taste experience, you can’t get those here although I’ve once had the pleasure of sampling a very bright red transplanted and cross-bred Sarawak durian at a stall in SS2 (Pahang Durian) that the owner gave us FOC since he saw we were such enthusiasts. I’m in the learning phases. Haha. I have this urge to go to a Penang orchard before the season ends so I can get some late season durians but I’m unsure about traffic conditions since school hasn’t started yet so traffic is bound to be very bad. It only restarts on Wednesday, I’ll see if I’m able to go after that. is so sad that they are forced to move from the SS2 stalls. That place is amazing, it feels so right having durian there. Bet their business when down badly after moving the the shoplots. Was about to ask which is your favorite but I kinda guessed the answer. They have a source that supplies very fresh and delicious D2 durians. 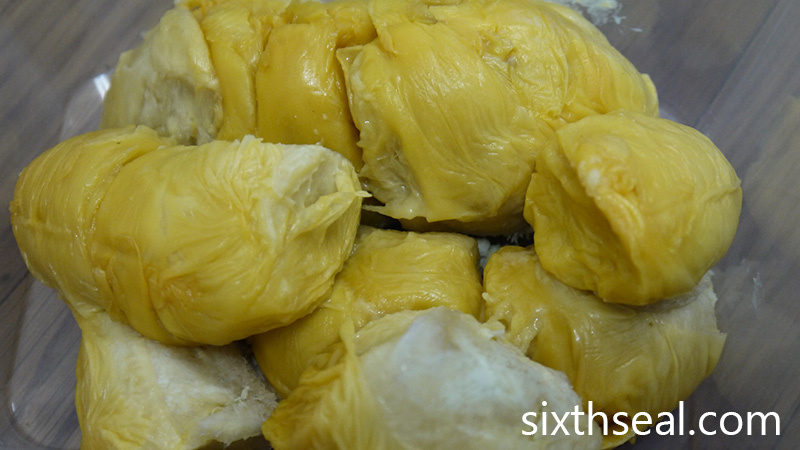 I’ve also had their Musang King (though not this year) and they’re quite good in that department as well. The prices, last I checked, was RM 40/kg for an old tree Musang King and RM 28/kg for a younger one. I love all kinds of durians, I don’t have a specific one I like more than others per se since I get different durians from different stalls – even got a batch of kampung durians to try out over the weekend. Honestly, I always enjoyed Penang’s durians when I lived and grew up there. but at slightly higher prices. All the durian orchards across the country are always targeting to sell to KL folks who are willing to pay any price for the best!! However, the trend has changed now. KL is cheaper than Penang. 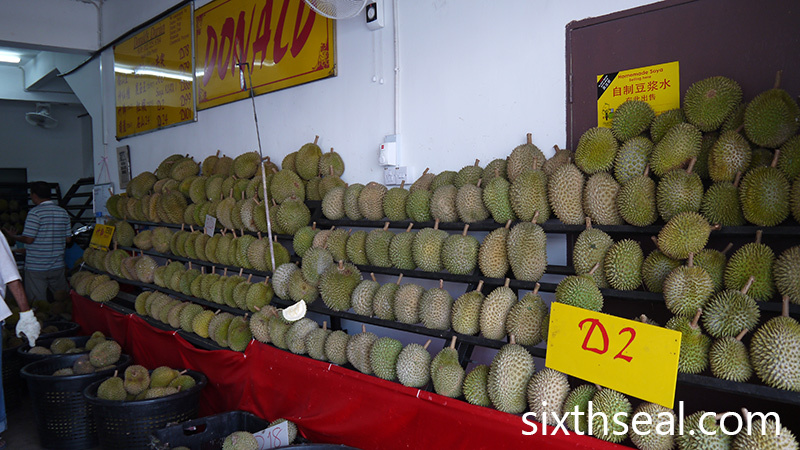 You can see Penang durians selling for RM 40/kg and more and it’s very common to do that – people in Penang are willing for pay those kind of prices for a good durian. KL has more competition and sources (Pahang, Johor, Selangor etc) so the durians are cheaper than Penang. 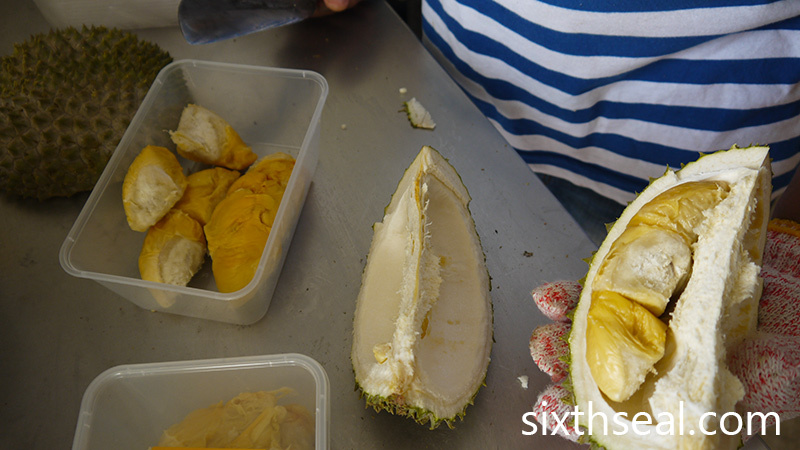 I personally think Penang still has the best durians though, a lot of the stuff doesn’t even come down to KL – the xiao hong durians, kim hu (goldfish durian), D6XX series, ang sim (red heart durian), ya kang (centipede durian), original Penang D175/Ang Heh and bak yu (pork lard durian). I like how you describe the taste of D2. It is also my personal favorite. The reason why you don’t easily find D2 in the market is because from experience D2 tree has the lowest yield compared to other clones therefore not economical for farmers to cultivate this clone. Only older orchards will probably still have D2. Half of my durian orchard is planted with D2 and I don’t mind taking care of them despite the low yield simply because it is still one of the better durians out there! I love the fibrous Dato Nina. It’s really hard to get it in durian stalls, and now after reading your comment, I understand why. I thought it must be somewhat related to yield as well or people would still sell it. Too bad, I saw some orchards grafting new clones like D158 into older durian trees coz they sell better. Good to hear that you’re still planting D2’s, would love to visit your orchard someday.